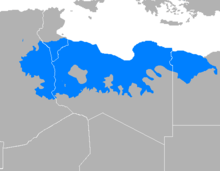 Libyan Arabic ( Arabic: ليبي‎‎ Lībi; also known as Sulaimitian Arabic) is a variety of Arabic spoken in Libya and neighboring countries. It can be divided into two major dialect areas; the eastern centred in Benghazi and Bayda, and the western centred in Tripoli and Misrata. The eastern variety extends beyond the borders to the east into western Egypt. A distinctive southern variety, centered on Sabha, also exists and is more akin to the western variety. Two major historical events have shaped the Libyan dialect: the Hilalian-Sulaimi migration, and the migration of Arabs from Muslim Spain to North Africa following the reconquista. Libyan Arabic has also been influenced by Italian, and to a lesser extent by Turkish. A Berber substratum also exists. The Libyan dialect is used predominantly in spoken communication in Libya. It is also used in Libyan folk poetry, TV dramas and comedies, songs, as well as in cartoons. Libyan Arabic is also used as a lingua franca by non-Arab Libyans whose mother tongue is not Arabic. Libyan Arabic is not normally written, as the written register is normally Modern Standard Arabic, but Libyan Arabic is the main language for cartoonists, and the only suitable language for writing Libyan folk poetry. It is also written in internet forums, emails and in instant messaging applications. As is the case with all Bedouin dialects, the /q/ sound of literary Arabic is realized as a [ɡ], except in words recently borrowed from literary Arabic. The following table shows the consonants used in Libyan Arabic. Note: some sounds occur in certain regional varieties while being completely absent in others. In western dialects, the interdental fricatives /θ ð ðˤ/ have merged with the corresponding dental stops /t d dˤ/. Eastern dialects generally still distinguish the two sets, but there is a tendency to replace /dˤ/ with /ðˤ/. The e and o vowels exist only in long form. This can be explained by the fact that these vowels were originally diphthongs in Classical Arabic with /eː/ replacing /ai/ and /oː/ replacing /au/. In some eastern varieties, however, the classical /ai/ has changed to /ei/ and /au/ to /ou/. Libyan Arabic has at least three clicks, which are used interjectionally, a trait shared with the Bedouin dialects of central Arabia. The first is used for affirmative responses and is generally considered very casual and sometimes associated with low social status. The second is a dental click and used for negative responses and is similar to the English 'tut'. The third is a palatal click used exclusively by women having a meaning close to that of the English word 'alas'. Although Western Libyan Arabic allows for the following syllable structure to occur. An anaptyctic [ə] is inserted between C3 and C4 to ease pronunciation, changing the structure above into the following. On the other hand, Eastern Libyan always has an anaptyctic ə between C1 and C2 in the following manner. Most of the vocabulary in Libyan Arabic is of Classical Arabic origin, usually with a modified interconsonantal vowel structure. Many Italian loanwords also exist, in addition to Turkish, Berber, Spanish, and English words. The bulk of vocabulary in Libyan Arabic has the same meaning as in Classical Arabic. However, many words have different but related meanings to those of Classical Arabic. The following table serves to illustrate this relation. The past tense is used in the case of verbs as it is more distinctive and has been traditionally used in Arabic lexicons. Canonically, these verbs are pronounced with the final 'a' (marker of the past tense in Classical Arabic). This notation is preserved the table below. However, the relation between Libyan and Classical Arabic verbs can be better understood if the final 'a' is dropped, in accordance with the elision rule of pre-pause vowels of Classical Arabic. 1. Western Libyan pronunciation is used in the above table. Italian loanwords exist mainly, but not exclusively, as a technical jargon. For example, machinery parts, workshop tools, electrical supplies, names of fish species, etc. Turkish words were borrowed during the Ottoman era of Libya. Words of Turkish origin are not as common as Italian ones. Before the mass Arabization of what corresponds to modern-day Libya, Berber was the native language for most people. This led to the borrowing of a number of Berber words in Libyan Arabic. Many Berber-speaking people continue to live in Libya today but it is not clear to what extent Berber language continues to influence Libyan Arabic. Libyan Arabic shares the feature of the first person singular initial n- with the rest of the Maghrebi Arabic dialect continuum to which it belongs. Like other Arabic dialects, Libyan does not mark grammatical cases by declension. However, it has a rich verbal conjugation structure. Nouns in Libyan Arabic are marked for two genders (masculine and feminine) and three numbers (singular, dual and plural). Paucal number also exists for some nouns. The diminutive is also still widely used productively (especially by women) to add an endearing or an empathetic connotation to the original noun. As in Classical Arabic, rules for the diminutive formation are based on vowel apophony. For nouns beginning with Qamari letters, the definite article is pronounced either [l], for words with an initial single consonant onset, or [lə], for words with a double consonant onset. Except for the letter j /ʒ/, Qamari letters in Libyan Arabic are the same as in Classical Arabic even for letters that have become different phonemes such as q changing to g. The letter j /ʒ/, which corresponds to the Classical Arabic phoneme /dʒ/ has changed from a Qamari letter to a Shamsi letter. For nouns beginning with Shamsi letters, which, in Libyan Arabic, include the letter j /ʒ/, the definite article is pronounced [ə], with the first consonant geminated. While marking verbs for the dual number has been lost completely in Libyan Arabic (like other Arabic dialects), nouns have a specialized dual number form. However, in Eastern Libyan it tends to be more widespread. Similar to Classical Arabic stem formation is an important morphological aspect of Libyan Arabic. However, stems III and X are unproductive whereas stems IV and IX do not exist. The following table shows Classical Arabic stems and their Libyan Arabic counterparts. iftaʿala əftʿal Possible innovation in Libyan Arabic. The general meaning of the stem is the same as that of stem VII and does not correspond to the Classical Arabic meaning of the same stem. It is used when the initial of the triliteral of the verb begins with some sonorant like l, n, m, r. If stem VII were used with the sonorants mentioned above, the n in the stem would assimilate into the sonorant. Like Classical Arabic and other Arabic dialects, Libyan Arabic distinguishes between two main categories of roots: strong roots (those that do not have vowels or hamza) and weak roots. Note that this classification is not always strictly followed. For example, the thirrd person femunine past of the root r-g-d, which is a u-verb, is usually pronounced [rəɡdət], instead of [ruɡdət]. Also, a-verbs and u-verbs follow the same rules in the past conjugation. 1. The i in an i-verb is usually pronounced [ə]. 2. In roots with initial uvular, pharyngeal and glottal phonemes (χ ħ h ʁ ʕ ʔ but not q), i in the present and imperative is pronounced [e]. For example, the root ʁ-l-b (to overcome) is conjugated as jeʁləb, teʁləb, etc. 1.Realized variously as a and ɑ depending on the consonant structure of the word. 1. In roots with initial uvular, pharyngeal or glottal phonemes (χ ħ h ʁ ʕ ʔ but not q), u, in the present and the imperative, is realised by o. For example, the root ʁ-r-f (to scoop up) is conjugated as joʁrəf, toʁrəf, etc. Conjugation in the Eastern Libyan Arabic is more fine grained, yielding a richer structure. Future in Libyan Arabic is formed by prefixing an initial bi, usually contracted to b, to the present tense conjugation. Thus, 'tiktəb' (she writes) becomes 'btiktəb' (she will write). It should not be confused with the indicative marker common in some Eastern Arabic varieties. Libyan Arabic is highly intelligible to Tunisians and to a good extent to eastern Algerians. However, for most eastern Arabic speakers, including Egyptians, it can be difficult to understand and requires some adaptation. Generally, all Italian and to some extent Turkish loanwords are substituted. It should be noted, however, that if a word is replaced, it does not mean that it is exclusively Libyan. The situation sometimes arises because the speaker mistakenly guesses that the word does not exist in the hearer's dialect. For example, the word zarda (feast, picnic) has close variants in other Maghrebi dialects but is usually substituted in Maghrebi contexts because most speakers do not know that such variants exist. Pidgin Libyan exists in Libya as a contact language used by non-Arabs, mostly Saharan and sub-Saharan Africans living in Libya. Like other pidgins, it has a simplified structure and limited expressive power. ↑ Hammarström, Harald; Forkel, Robert; Haspelmath, Martin; Bank, Sebastian, eds. (2016). "Libyan Arabic". Glottolog 2.7. Jena: Max Planck Institute for the Science of Human History.